The no make up selfie campaign raised an astounding amount of money by daring women to go bare and post the evidence. While these types of stories highlight and reinforce the power of social media in bringing people together, I can’t help but also notice how much of an important role makeup seems to play in some women’s lives. 1. No one cares. Seriously. As you might imagine, it was a massive deal for me. I felt naked. I felt vulnerable. And so, so self conscious. But the people around me couldn’t care less, despite my expectation of a full on social shaming when I went outside. But no one cared. They still treated me like the same person I always have been. A study by the New York Times found that women who wear makeup are perceived as being more likeable and trustworthy compared to women with no makeup on. However the way the study was conducted doesn’t really reflect real life interactions. In the study, participants were given four photos of the same woman. 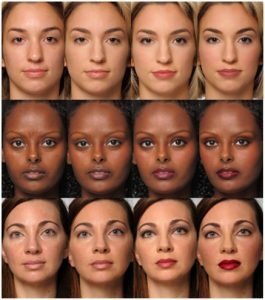 The woman had the same blank expression in each photo – the only difference was that the photos ranged from au naturel, to a full face of makeup. The participants were then asked to judge which face they would trust the most. Yet according to behavioural studies, body language is also an important factor when it comes to judging someone. How people react to each other also influences the judgements they make. 2. A smile is worth a thousand lipsticks. Seriously. Smile more. Don’t be horrible and people will naturally see you as more appealing. Studies have found that we generally judge people harshly when we’re in a bad mood and judge people more generously when we’re in a better mood. We’re also more likely to judge people in a positive light if they’re nicer to us. 3. It’s freedom like no other. For a while, makeup used to dictate my life. Without it I’d feel unfinished. Hesitant. Like I needed to slap it on as soon as possible. Now. I can relax. I feel like I can truly be myself. I feel like the people talking to me, actually like me for me and not my expensive Mac foundation. I found I had more time to do things. If a friend rang and asked to hang out, I could be ready in ten minutes. Camping? Yeah, why not. Running in the rain? Course!! Gym? Yes please!! I don’t have to structure my life around my makeup. Not wearing makeup opened up something in me. I felt like it was the first step to trusting my personality rather than hiding behind my eyeliner. It made me more confident. In a way it made me more daring. I felt like I could do and try do much more now. It was almost like the real me had been released and was living and breathing every day to its fullest. It may sound lame and a little cheesy and maybe other women had completely different experiences, but for me, it was the best decision I ever made. And now, when I do wear makeup, I feel like it’s suppressing the real me. Looking in the mirror now, I see so much more in me than I did two years ago. Two years ago, all I would see in the mirror are the smudges of my eyeliner that I had to redo and the spots that needed concealer. Now I see someone who has so much potential and has so many different adventures to look forward to. It makes me excited for the future.